The gorgeous Chandratal Lake in the Lahaul region of Himachal Pradesh, India. Mridula Dwivedi Photos. It was love at the first sight. I didn’t even see her in person, it was just a picture of the Chandratal Lake on internet! At the height of 4300 meters, Chandratal Lake is in the remote Lahaul region of Himachal Pradesh, India. In 2007, my husband, nephew and I trekked nearby. Back then the existence of a road to the Chandratal Lake was rumored. People more commonly recommended a hike from the Kunzum La Pass to the lake. The roads had more of mud and stones, than tar. The guides on the cloud filled lake. They would merge in small waterbodies and then emerge a little ahead as roads again. After the trek, I sounded my family for a detour but inexplicably they wanted to go back. The view near the tremendous Rohtang Pass. The nearest dhaba, Chandra, was 14 kilometers away at Batal. There was nothing else for miles around. There was no phone connection, no electricity. I was not willing to travel alone in that isolation. My dream of visiting Chandratal remained a dream! I was an assistant professor back then in 2007. I got busy with life, Chandratal was relegated to some remote corner of my memory. It resurfaced in 2014 without any particular reason! I was a professor by now. We met our trusted guide, Rama Kant Sharmain 2011 on a trek in Himachal. My nephew, Dilip, the same brat one who refused in 2007, and I planned to visit the lake with him. There certainly was a road to Chandratal now. Seven years later, it still had more of mud than tar. It takes a sturdy vehicle to reach there. Only in July 2014, the road was damaged due to a landslide. The road to Spit with 'Spiti Blue' skies. My guide was aware, so he suggested we trekked to the lake. We agreed immediately. I really wanted a glimpse of the lake. The weather looked hopeful when we started from Manali, the last large town and a popular hill station. We were carrying our own tents and kitchen. Actually others were carrying it, I just had a small shoulder bag! We had a tough time negotiating a ‘pagal nala’ (mad stream) after Chhatru. Our driver, Ranbir ordered everyone out of the jeep to reduce the weight, only I was allowed to sit inside! After we crossed it successfully he told me grinning, his vehicle, a Tata Sumo, didn’t have 4X4 wheel drive. Who needed it anyway? But the weather had turned a uniform grey by now. Lahaul and Spiti are rain shadow regions, and yet it was drizzling. We reached Batal, our first camping ground late in the afternoon. After seven years the place had two dhabas, the old Chandra Dhaba run by the legendary Chacha and Chachi (uncle and aunt) and the other by a local shepherd! The road still had more mud than tar. There was still no phone connectivity or electricity. The next day it was drizzling again. We walked all of the 14 kilometers in mild rain. We pitched our tents in rain. Tried from the walk my nephew and I dozed off. We woke up to the sound of the raindrops falling on the tent. We felt so downcast that we didn’t even bother to go the lake! The morning brought more clouds though no rains. We eventually dragged ourselves to the lake. After seven long years, I was face to face with my obsession. However, instead of blue everything was grey. I met another Indian traveler there. We figured out that we followed each-other on twitter! He had been at Chandratal for last two days with no luck either. It made me feel a little better! My guide suggested to come back in 2015! A friend called in August 2015 to say she was to going. It made sense to go together as it would be cheaper. By now I had quit my job! We went with Ramakant ji again! In August 2015, it was not raining. But neither did the sky exhibited the typical ‘Spiti Blues’. The roads still had more mud and stones than tar. But it was not broken this time. Batal has two dhabas without phone connectivity or electricity. The camping ground has been pushed further back by the forest department this year to preserve the lake. As we went to the lake in the evening, the sky was probably a tad better than my previous sojourn. The lake was eluding me with a vengeance or so I though! I had a headache due to the altitude. I had trouble eating and sleeping. But I went to the lake again in the morning. My luck still didn’t change. Even after standing on its shores thrice, I did not get one decent picture. We continued further to Spiti, this time to Tabo and Dhankar. I got the ‘Spiti Blue’ skies as we reached Dhankar, our last stop. On our way back to Manali, we decided break journey in Chattaru. The driver has the toughest time on a trip to Lahaul and Spiti. The roads are non-existent, with no repair for miles around. On our way back we were making good time. Now that I was going away, the skies were exhibiting the ‘Spiti Blue’! It occurred to me that we could go again to Chandratal instead of Chattaru. But for at least 20 kilometers I kept the thought to myself. It took me a long time for me to gather courage. The new plan would mean more work for Ranbir. But in the end, the urge to photograph the lake in all its glory won out! I blurted it out. Surprisingly everyone agreed to the change in plans without any real fuss. I was back at the Chandratal camping grounds! However, even though the sky was bluest of blue, I left something out of the calculation. There was a stiff wind howling about the place, which meant no reflections! I did go to the lake but I was foiled for a fourth time! My last chance was now in the morning which dawned fine. But there was a hint of a breeze. I was nearly distraught. Still I decided to go to the lake. There was hardly anyone about. Ranbir dropped me at what is called the ‘parking lot’. I almost ran through the short distance to the lake. Even the sun had not reached to the valley, yet. An hour later the sun was out, the sky was blazing and the wind had dropped completely, which meant that the mountains were reflecting in the lake! After eight long years, I had a chance to click the picture I wanted to since 2007! Eventually I asked the lone person around to click a picture of mine. And he told me it was his first ever trip to Chandratal! 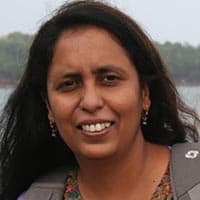 Mridula Dwivedi is an ex-professor and travel blogger who loved to trek the most. 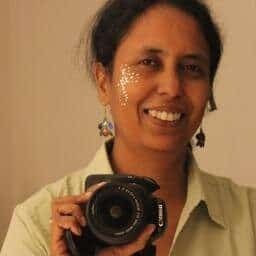 She blogs at Travel Tales from India. You can find her on Twitter and Instagram too. I am planning to visit Himachal this month. I am a history lover so please tell me that is there any historic place in Himachal ?